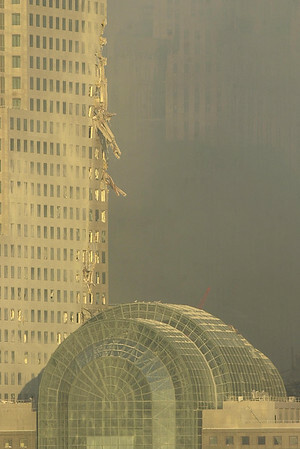 010913 NYC/WFC--dan cappellazzo photo--A close up of damage to 3 World Financial Center which is located next to where the WTC towers once stood. Officals are concerned that this is the next building to collapse. Also pictured is the Atrium bottom right, which houses the make shift mogue.